Alright, there’s a lot of bad horror games out there; a cursory glance of Steam Greenlight and ModDB can prove that. The recent influx has caused much exasperation in the game-playing public, and became a source of pushback when I tried proposing horror games for my senior game project. When I asked the faculty about the audible groans they emitted when hearing the word “horror”, they all pointed to a really similar issue: previous teams depended too much on the “scary”, and not enough on the actual gameplay. Again, looking at the spate of half-baked games flooding the market, this seems to be a prevalent issue. Tension is the most commonly used technique we’ll be talking about here, not just in horror, but in a plethora of genres. Getting an exact definition is tricky, so let’s try to use some in-game examples to find out where in our loop this is happening. A common staple in 2D Mario games are stages where the screen moves at a rate independent from the player. The player needs to move along at a rate similar to the screen, or risk losing sight of where they are and falling off, or potentially getting “crushed” between the edge of the screen and an obstacle. A common technique in these levels is to put greater rewards along paths that take longer, encouraging more skilled players with riskier play. I remember these stages being particularly stressful, since I was constantly running out of room and time to execute my strategies. An example of tension utilized in horror is the “archives_cellar” map from Amnesia: The Dark Descent, often called “The Water Level” (we’ll be referencing this map a lot). In it, the player is confronted with an invisible monster that can only attack the player if they are standing in the water of a flooded area, and they must jump from crate to crate in order to remain safe. Another obstacle present in the level is a gate that the player needs to open by pulling the lever. This is complicated by the lever being on a timer and being a distance away from the gate itself. 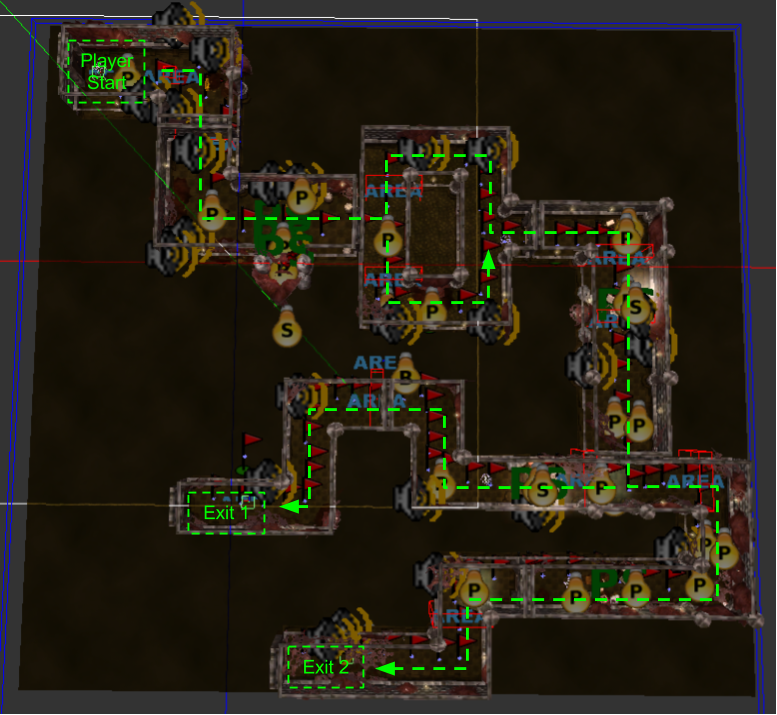 The time pressure is communicated to the player by a constant “clink”-ing noise, giving an audio cue that the gate is constantly at risk of closing. Because of this, the player needs to accomplish their task while running out of time, and have a severely limited amount of space safe from the monster in order to accomplish this. Looking at these two examples of tension, there are two main similarities despite the disparate genres: the first is that the tension occurs after the player knows the problems presented to them, but before the problems are solved. Because of this, it takes place mostly when the player is planning or executing their solutions. Second, in both cases, the player is “running out” of something; more importantly, they’re losing something that can be used to accomplish the goal that has been set before them. In the two cases above, these things are time and space, but certainly other things can be utilized as well. In the survival horror genre that was popular during the mid-to-late 90’s, much of the tension came from giving the player limited resources to use for problem solving, most commonly firearm ammunition. 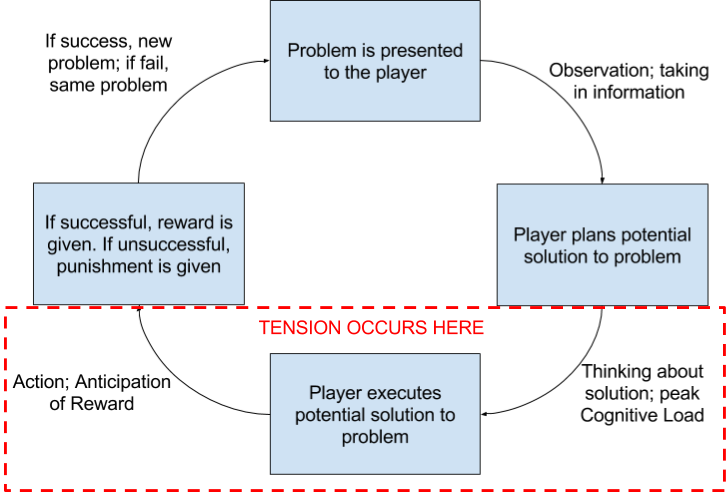 TENSION: Pressure that occurs when the player experiences a loss of resources, which may prevent them from accomplishing goals. One of the most maligned aspects of lazy horror, the jump scare is seen as one of the trickiest things to pull off. In horror, these are commonplace, so perhaps deconstructing a jump scare in a game of another genre would be helpful in this regard. Unfortunately, these are very rare occurrences, but luckily Puzzle Agent happens to have a good example. When I first played this, I was really surprised by it: how could I have been so startled by something that looks like a garden gnome? And in a puzzle game, no less. The most interesting part is that the game does this again later, and it’s just as effective. The set-up is the same: the player is mid-way through a problem, when a gnome accompanied by a thunderclap steals a piece of the puzzle. This was the initial game that made me consider what about the design made this so effective. So, are there similarities with examples from horror games? Well, let’s take a look at Outlast: in the first level, the player is introduced to a bookshelf-type obstacle that they can shimmy through to pass. As in typical level-design fashion, the first instance of it includes a tool-tip, and is presented without incident. This may seem really basic, but there’s an impressive amount of information being communicated here. First off, it accomplishes its goal in scaring the player. Second, it advances the plot, and moves the player to the next gameplay area. Third, it introduces Chris Walker, an enemy that the player will encounter frequently throughout the rest of the game. And finally, it shows the player one of Walker’s behaviors- later in the game, Walker can reach into gaps and grab the player, an ability that is unique to him. Again, what commonalities do these examples have? 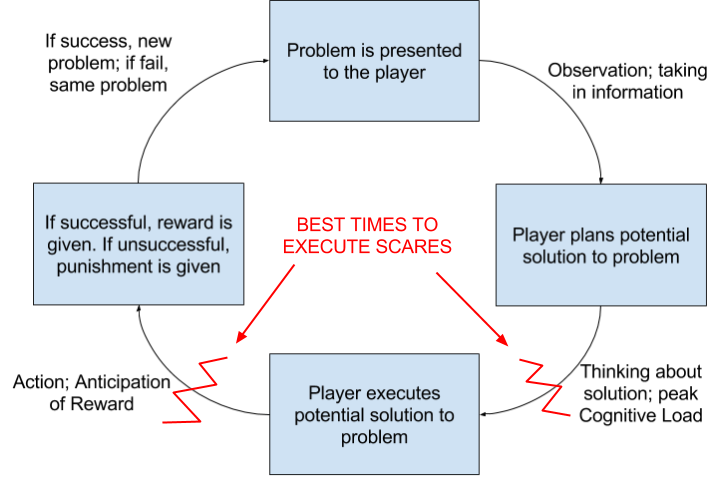 In terms of our gameplay loop, it looks like the scares were triggered when the player was trying to achieve a goal, either thinking about what they were going to do next, or were anticipating a reward. Furthermore, these game loops were already established- in Puzzle Agent, the player had already completed multiple puzzles without incident, and in Outlast, the player went through a narrow gap already, showing what happens when done successfully. This directly ties into a psychological concept called the cognitive load. This refers to the amount of working memory the player is using, “working memory” being what the player is actively considering at one time. Puzzles are particularly cognitive load-heavy, but planting an expectation of reward in the player’s mind with other mechanics is just as effective- an expectation set up by your gameplay loop. Before we move on, this is where I need to stress the importance of having solid gameplay: the more you understand the loop of each mechanic you have, the better idea you’ll have of when and where to pull off scares for the player. The thing about using your mechanics to set the player’s expectations is that scaring them using this technique makes them anticipate it later in the game when using the same mechanic. While that’s great to establish a pervasive sense of dread, it makes subsequent attempts to scare players less effective. Because of this, it’s wise to plot out methodically what mechanics you’ll employ this with and when, and then limit using that specific loop to once or twice a game. As I said at the beginning, the more mechanics you have, the more you can employ this technique. And if you want to get really creative, you can use base expectations the player has about how they interface with the game: can you make a scare with altering controls, physics, or how the screen renders? There’s plenty the player assumes already that you can tap into. Chase sequences are a relatively new paradigm in horror design, and most of them seem to stem back to that map from Amnesia we looked at earlier. Though the colloquial term is “Water Level”, most players are actually referring to two maps, the second of which is an extremely linear level where the player’s only option is to run from the monster. Frictional Games’s next game, SOMA, also utilizes the chase sequence, and employs a similar structure; the player encounters a teleporting enemy that they are discouraged from looking at, and need to go to an area to complete an objective. After doing so, the enemy chases the player back down the halls they traveled through. Unfortunately, the consensus among my friends and some reviews have noted that this wasn’t as effective as Amnesia’s chases. There was one instance of a chase sequence in The Cursed Forest, an indie horror game whose big selling point was that it was made in CryEngine, as opposed to Unity or Unreal. Regrettably, though, it doesn’t seem to completely pull it off. So, why did this happen? A good indicator is that this sequence, unlike Frictional’s work, does not have the monster as an obstacle before the chase; there were certain previous points where the player could be killed, but these typically amounted to a button press, with no chance for the player to react. We don’t know how this shadow creature behaves and for the rest of the game, we don’t interact with it in a meaningful way. Simply put, we don’t know its gameplay loop. In comparison, we get a whole level before the chase with the water monsters in Amnesia, as well as one with the deep sea diver in SOMA. Not only do we understand their behavior and how to avoid them, we also know that they’re a threat. As it turns out, there are two points where the player needs to make a choice about which path to move forward with. The really interesting thing, though, is that both paths in the first choice immediately converge back into each other. In addition, the second choice presents two paths that both lead to a door that loads the next level. Presenting the player with these uninformed and ultimately meaningless choices under pressure adds a ton of stress to the level, but does not add difficulty or punish them. Since there are no dead ends, if the player keeps moving forward, they will most likely succeed. SOMA takes an approach that’s a bit more complicated: there are multiple dead ends in the environment that the player needs to know in order to avoid them. The game mitigates this, however, by making the player walk one way through the level, making sure the player knows the environment before they are tested on their navigation skills. This is usually referred to as “previewing”, and is a fairly common level design technique. Unfortunately, the initial walking through of SOMA’s level requires the player to avoid the enemy in a non-chase context, discouraging the player from exploring and really knowing the area. One last example of a chase sequence: in Outlast, there’s a lengthy section where the player is being pursued by hostile patients (and yes, the player has encountered these enemies before). This segment breaks from the form of Frictional’s games, in that the level is completely linear. The game makes up for this, though, with heavy objects the player can shuffle to block doors: they even put one in front of the first door in this sequence, to make sure the player understands how they work. This creates a risk/reward relationship with advancing on the path; the player can take the time to go back and blockade previous doors, potentially earning more space from the enemy. There was a similar system in Amnesia’s water chase; one mechanic throughout the game was that players were able to manually swing doors shut. During the water chase, the player has the option to go back and close doors they need to open, potentially stalling the monster pursuing them. The Cursed Forest doesn’t create a potential reward for going back along the chase route, making for a fairly stale section of “move forward to not die”. CHASE SEQUENCE: A largely linear level where tension is present from an enemy pursuing the player as well as a lack of alternate paths. Mechanics may be introduced to encourage risk taking, with a reward of more resources to evade the enemy. I hope this article sheds some light as to how horror games achieve the tone that they seek through mechanics and systems. 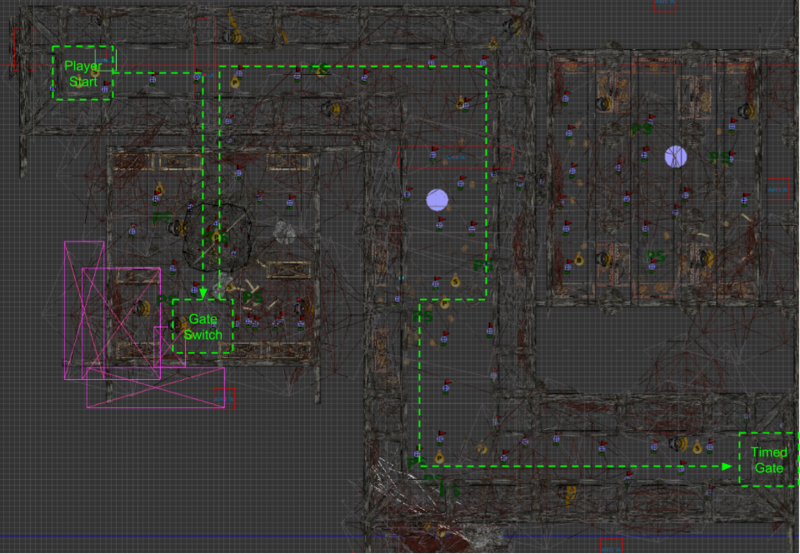 Again, making a horror game engaging requires the same skills as any other game, just applied in different ways. The more you know what makes your game tick, the better the experience will be. Wow, an amazingly written and documented article. Looking forward to more of these! Nice work Jared! Looking forward to seeing this amount of research going into your research phase for the capstone project. Wow! Very informative post, I really liked the examples you used and the layout is phenomenal.